Comic Con 2011 – Day 2!! Today was a busy day!! Up at 6am. Well actually my alarm was set for 6am but I woke up at 5:58am. Got ready and met my friend who graciously got in line at 6:30! The line was looooooooong. They made 1 giant line for everything but Hall H this year. We high-tailed it over to the Ballroom 20 line and were about 1500-2000 in line. So no problem on getting in – yay! They let us in around 9:15 I guess and then the panels started at 10. I don’t watch Torchwood but have heard of it on twitter and tumblr. I didn’t know it was a Doctor Who spin off. So I know nothing of the show but the cast was awesome! Totally made me want to watch the show. The lead (John Barrowman) led us in song at the end of the panel – we all were singing Annie’s “Tomorrow” as the panel ended. He was a giant crack-up who I think must live on 5-Hour Energy shots. He was cracking jokes and puns every 2 seconds! And looks so much like Tom Cruise it’s weird. I am a little afraid to get excited and start watching the show since that happened last year with Stargate: Universe and I bought the season 1 and 1.5 DVDs and caught all up in prep for season 2 and then they cancelled the show during season 2. What the frack.?? But Torchwood is on Starz and not SyFy so maybe better luck? Then it was The Walking Dead panel. I watched 2 (maybe 3) eps last year and stopped after the horse death. I just could not go on. But this panel and the scenes for Season 2 that they showed us convinced me to watch the last 3 eps in Season 1 (they made a short season). It does look really good. So I’ll give it another try. Much like with Game of Thrones books, I will just fast forward past the sadness. Then it was Big Bang Theory!!!! Such a great cast. Last year’s panel was super fantastic and this year’s was awesome too. They are just so funny and great with the Q&A. Love, love, love them. Finally got in for the Sony panel – yay! They had the directors and cast for the Ghost Rider movie. It does look fun and Nic Cage is always kooky at panels. The director seems a bit insane. They showed some stunts that HE was doing to get certain shots. Very cool. So I will probably see it on DVD. The next movie didn’t really belong at Comic Con genre-wise but it looked damn funny. Called “30 Minutes or Less” with Jesse Eisenberg, who was not there, and Danny McBride, who was also not there but sent a clip introducing the movie and apologizing for not being there and it was hysterical!, and then Aziz Ansari who was there and he was FUNNY! Definitely want to see this movie. And I need to add Parks and Recs to my tivo line-up. I only have BBT for comedy and need more! Then Total Recall time!!! Colin Farrell, Kate Beckinsale, Jessica Biel, Bryan Cranston and John Cho. They were all great! Fantastic Q&A with both the moderator and the audience. The movie footage looked super cool and fun. Also – Colin and Kate are hotness. I definitely want to see this. And I was against a reboot/remake/retelling going in. Then finally Spiderman. When I first heard of this reboot I was like “are you kidding? It’s only been a few years since the last Spidey with Tobey Maguire?! ?” But the footage we got to see with Andrew Garfield as Spidey and Emma Stone as Gwen Stacy looked excellent! Plus Martin Sheen, Sally Field, Denis Leary – great cast! Again – I will see this one for sure. And Andrew Garfield is kind of adorable. But what the heck? He is British ( I had no idea from The Social Network) and he is playing Spiderman and Henry Cavill (Brit) is going to be Superman – what the heck??? The Brits are invading!! Oh well…that’s ok…love the accent. 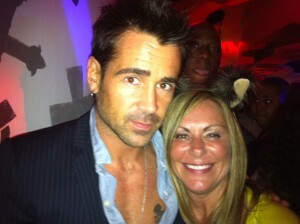 While husband was in Hall H, and me out in line, he saw the Fright Night panel (yes, another reboot) with Colin Farrell. And he won a ticket for a special premiere tonight. So we went over after the Con and the ticket was only for 1 admission but the bossman at the door let me in too (he must have liked the wolf ears I was still wearing!) Tons of yummy food and drinks. The place was decorated in gothic vampirey and slayer mode. Very cool. With all of the weapons that thy have in the movie on display. Then the cast showed up! And I wiggled in and got a pic with Colin Farrell – yay!! He is so hot in real life. Yum. But he was also extremely nice and patient with people pushing in and asking for pics and autographs. Very, very cool. I also talked to Anton Yelchin and told him that I loved him in Star Trek J Funny thing – Colin Farrell is much taller than I expected. I guess not all actors are short. We then got to see the movie (with free popcorn, soda, water and candy!) The movie was super fun. I barely remember the original but the story came back to me as I was watching it. Very fun, campy horror movie. Oh – and it was in 3D. So some cool effects. A very fun event. And funnily (my word), it’s the first movie I have seen entirely in 3D. I have not been part of the crown rushing out to see 3D movies. Not very cool of me I know. But I just don;t care unless it really enhances the movie. This movie was campy and fun so the effects being thrown at you were blood and vampires and stuff so that was pretty fun. But some of the movies they have done in 3D, I’m like “Hmmm….really?” I’m sure Avatar was amazing in 3D but James Cameron filmed that in 3D. Didn’t just add it as an effect. So my take is if it will enhance the story or my enjoyment – cool. If it’s just a way to add a few flying things and get a few more dollars in ticket prices – no thanks. But then I do most of movie watching at home from NFLX anyway. Then walked back to the hotel at 1:30am where I am now icing my ankle which is the size of 2 ankles. But a fun, long day at Comic Con 2011!! Not sure what the plan for tomorrow is yet. But I need a bit of sleep. And would like to try for my Con shirt (if any left in small) And you know what? I have not even checked out the Star wars booth yet. Sacrilege. Total Fail!!! Need. To. Do. Saturday! So my friend got online at 6:30. I met her at 7am. And we are about 2000 back but Ballroom 20 holds about 4200 so we are good to get in. So now we are sitting here on our little chairs we “won” at the Ringer panel. Genius swag. We saw a pair of what I think were furries. Creepy. Another woman wearing high heels. Serious stupid. I’m all for being cute but heels are so dumb here. Like watching the LA douche couple get in line for Hall H yesterday – guy in his Ed Hardy finest and girl in a silk sheath dress with 5″ heels…sinking in the grass. Those are the real dorks here. Oh – we are moving! Gotta go!